An article on Huffpost reports a man being apprehended after a chase over fences and through backyards by a police dog named Boomer. Of course Boomer's 'partner' engaged in the arrest but was not named in the account. Police were responding to a complaint of a woman in distress who was found unconscious after possibly ingesting GHB which was found in a milk jug on the scene. The 43-year old man was arrested and charged with breaching his bail conditions for allegedly having contact with the woman and for possessing or consuming drugs or alcohol. 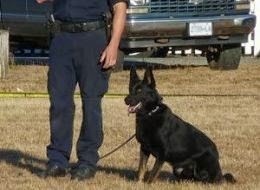 The man was treated at NRGH for dog bites sustained during the pursuit and 'collar' by Boomer.